Here are the pictures from Fitzgerald Stadium Killarney where a large crowd gathered to welcome the team. 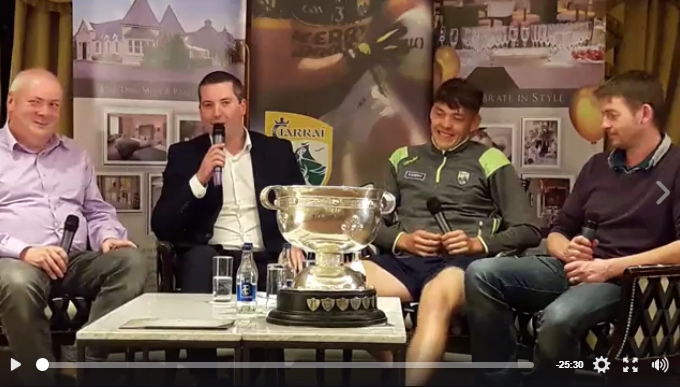 On Thursday Kerry Gaa Tv was Live at Meadowlands Tralee. Maurice and Sonny had a hurling review and spoke about dual players. Sonny had a song about a footballer from Valentia. Next up was Marc OSé who put the four in a row win in context. St Pats Blenerville ballad group played and sang. Fionnán spoke to lots of Kerry Minor winners. Brian Caball Austin Stacks had a story. Final section was a focus on Fossa GAA Club. Dermot and David Clifford joined Chairman Tommy Cahill.